Just when you thought that rock was dead – not officially, of course, but certainly without much of a pulse where the charts are concerned – Black Sabbath release their latest album 13 that goes straight to number one in the UK album charts. It's an indication that there's still an appetite for loud guitars and drums and that. This latest album from Josh Homme and his fellow Queens of the Stone Age also did well in the UK charts, reaching number two; they did one better in their native home stateside however by claiming their first number one in the US album charts. Although they're bound to be chuffed by the news, you get the impression that the band aren't exactly spurred on by success. 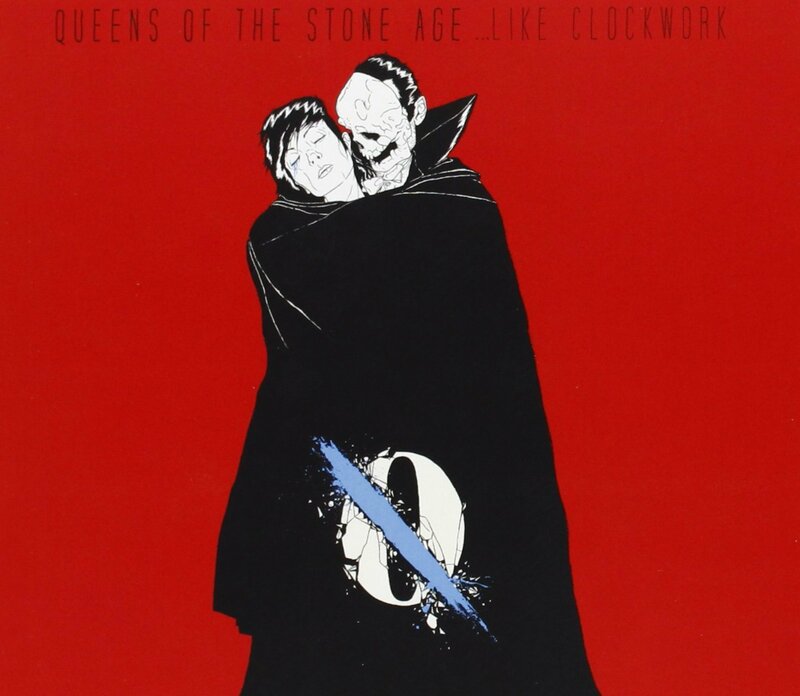 Listening to a QOTSA album is almost a voyeuristic affair, as you imagine Homme and pals making the music they play almost entirely for their own pleasure. It's difficult to describe what exactly is a commercial hit these days, but whatever it is, you wouldn't necessarily pin it on these guys as either wanting it or courting it. The perfect example would be the first track 'Keep Your Eyes Peeled'. It's a slow starter laced with a growling guitar that sounds in the foulest of moods – cross it at your peril. If a serial killer was having a quiet night in, with a few brewskies, in their secret dungeon lair, they'd probably have this on in the background. The tempo is lifted considerably with 'I Sat by the Ocean'. Electric strings and drums support Homme's vocals that take flight once or twice throughout. It has an understated urgency that beckons you in. A piano intro follows. This isn't the band doing some smooch-type ballad is it? With Homme almost whispering lyrics to the start of 'The Vampyre of Time and Memory' you would possibly think so. But it grows, with some futuristic-sounding synths that may have been borrowed from Blade Runner; then waves of guitars and drums bring on the roar. 'If I had a Tail' features David Bowie-like vocals from Homme; his delivery is darker in tone, with even more of a swagger. The song has a delicious dark, glam rock quality that also musters up a suitable slab of sinister. The band turn up the tempo as well as the volume for the first single 'My God is the Sun'. It has an intro that was clearly branded in the fires of hell itself, or at the very least somewhere close by. It takes a breath or two just long enough for Homme to catch up with proceedings, before shooting off another round or two over head. In short, it rocks. 'Kalopsia', a track co-written by Alex Turner of Arctic Monkeys fame (who also helped out with vocals on 'If I had a Tail')starts off with a slower, calmer attitude. All that changes a minute or so in however, as the heavens open with the raining of thunderous guitars. Calm returns, albeit briefly, before the noise descends once again. Elton John. Not a name you would immediately think of as a good fit with this particular band, but surprise, surprise, he turns up with vocals and piano duty on this rousing track 'Fairweather Friends'. Again it has a cool, seventies vibe rattling inside its bones, as it soars majestically above all who listen to it. It's loud and brutal. 'Smooth Sailing' is a rock track dipped in grunge. It sounds like the mix is a little out of kilter, but it's an audio illusion whipping around your ears with a graffiti-scribbled wall of noise. Delicious hot or cold. With the end in sight, the band take stock with 'I appear Missing'. It's easily the longest track on the album at just a spit past six minutes. It takes the guise of a rock anthem, with a number of twists and turns throughout, making it a little tricky to second guess. The final eponymous track does take it deliberately slow as the album's swansong. And when a guitar finally arrives, it does so with the grace not to gatecrash the party. It acts as a catalyst for an energetic chorus, before settling down and tucking itself in for the night. Sweet dreams. The band must be doing something right as this sixth studio album has easily been their most successful to date, in terms of chart success. Not that the band care about such things. Hopefully not. They may have a certain air about them as being musicians' musicians, which they probably are, but it doesn't make them any less accessible for the likes of us. If rock is indeed making a welcome comeback, ...Like Clockwork could be considered one half of the defibrillator, bringing it back to glorious life.